This coming weekend is the chocolate festival at Ghirardelli Square. Do I need to tell you where I’ll be? 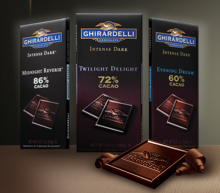 Until then, you can participate in the Ghirardelli Intense Dark Challenge. You can win several prizes and everyone who participates gets a $1/1 coupon. Head over to Ghirardelli and take the challenge!